Spotify is one of the best streaming services around because it offers great music discovery and options to share music with friends. The regularly priced Quboz options aren't bad, but for $9.99 there isn't anything that makes it better than the competition. It's the hi-res option Sublime+ option that makes this service stand out, but prepare to pay for it. Like Spotify, YouTube Music is just an all-around solid option. But when you combine it with ad-free videos on YouTube by getting the premium option it's a great value for anyone that already watches YouTube. Apple Music is one of the more popular services and comes with some pretty cool features like live radio and exclusive songs/albums from some of the most popular artists out right now. If you want music first, this is your best option. With high quality files available for streaming, curated playlists, and exclusive live events, Tidal is the one to go for if you want to get the most out of a music streaming service. The top 5 streaming services. As fun as it trying out different headphones and speakers, it isn’t the reason the audio community exists. However good your favorite speakers or headphones might be, you don’t love them. They’re just a tool to help you experience what really matters: music. Thanks to the internet and streaming services, it’s now easier than ever to get access to literally tens of millions of songs. More music than you could listen to in a lifetime. But with so many streaming options and so much music, how do you know which one is right for you? We did all the research and picked a few of the best, but we also go over and compare some of the other alternatives as well. Editor’s note: this article was updated February 15, 2019, to account for Qobuz’s expansion to the United STates. Spotify is one of the biggest and most prominent music streaming services available right now, and that’s one of the reasons it’s best for the majority of people. Aside from having a massive library of music to choose they also excel at helping you discover new music thanks to a combination of curated playlists by people, and smart algorithms that learn your preferences over time. One of their main features is the Discover Weekly playlist, which will suggest a playlist of new songs every week that the algorithm thinks you might like. On top of that, it’s also easy to share tracks between friends or to social media, which is part of the reason why we use Spotify links when reviewing products. Features aside, Spotify is also available in a number of places and has a free model that was recently changed to include a number of curated playlists you can choose from. Now as far as sound quality goes, Spotify isn’t the leader of the pack by any means. Free users will max out at 160kb/s, but if you’re a paid premium user you can up that to 320kb/s. It also uses a file format called Ogg Vorbis, which is an open-source alternative to the MP3 format. If that means absolutely nothing to you don’t worry, we made a graphic explaining which formats have better quality that you can see down below. For now, just know that the Spotify way of doing isn’t that bad for the majority of listeners. Now if you want the best sound quality possible, that’s where Qobuz comes in. Qobuz might not have the biggest user base, but it does have the best sound quality streaming. The problem is availability. The company is based in France and has only recently found its way into other countries like the UK; it’s now available in the U.S. It have a few different plans available depending on what you want and how you want to pay for it. The base $9.99 per month plan limits you to 320 kb/s MP3 files which, let’s be honest, isn’t going to blow you away. A step up from there gets you to the Hi-Fi option for $19.99 per month which allows for CD-quality lossless streaming at 16-bit/44.1Hz FLAC files. Then the last two options are one-time payments for one year of access. So basically yearly payments if you plan on keeping the service forever. There’s the Sublime option which gets you the same Hi-Fi CD-Quality streaming but also gives you access to download Hi-Res 24-bit MP3 files from their music library. This option is a one-time payment of £219.99, but wait! There’s more! (I couldn’t resist) If you really want the best quality possible you can go even further with the Sublime+ option. By paying £349.99 you get access to the 24-bit MP3 library to download music from, but you also get the option to stream 24-bit/192kHz FLAC files which is the best quality currently available for streaming. Of course, the downside is country availability and pricing, but if you want the best sound this is the best there is. The history of Google Play Music (GPM) is one of rebranding and confusing crossovers with YouTube. But now that the process is finally (hopefully) over and it looks like the new YouTube Premium is one of the best options out there. It keeps a number of the useful features people loved about Google Play Music—including a fairly large library of music you can stream from—and the option to upload your own songs to a personal library. Though at the time of this post that feature hasn’t yet been ported over to YouTube Music. YouTube Music is also compatible with compressed lossy files like MP3 as well as lossless files like FLAC if you’re uploading music, but the service lets you stream MP3 from its massive library. Google also does a pretty good job at helping you to discover new music with playlists based on moods and genres. It isn’t as personalized as what you might get from Spotify but it’s constantly getting better and their playlists are still pretty good at the moment. But one of the main reasons YouTube Premium is so versatile is because it comes with what used to be YouTube Red. In other words, ad-free YouTube videos. So not only do you get one of the best and most robust music streaming services around in YouTube Music, but you also get an ad-free YouTube experience which is worth $11 a month by itself. The music aspect is just the cherry on top. Because it’s Google, it’s also easy to get whether you’re on iOS, Android, or just in a browser. As of right now, YouTube Music is slowly rolling out to users with the Premium option set to come in the very near future. This is mainly a thing for anyone who listens to popular music like Frank Ocean or Drake. Apple Music has plenty of deals with artists and record labels, which usually results in an artists’ newest album being exclusive to the platform for a set amount of time. So if you wanted to stream Views by Drake when it was first released, you needed Apple Music. Otherwise, you had to wait for it to reach other platforms like Spotify and Google Play Music. Apple isn’t the only company doing this, but it does tend to get music first in general. So if hearing an album as soon as it drops is important to you, Apple Music is probably your best bet. To be fair no one seems to be happy with album exclusives. And it seems like Apple is beginning to move away from this model. But for now, it’s still something to consider. As far as quality goes Apple Music uses the AAC which streams at 256 kb/s. Like GPM, you can also add up to 100,000 songs from your own iTunes library and stream them on the go. But wait. A hi-fi subscription to Tidal is $19.99/month isn’t it? That’s twice as expensive as Spotify, Google Play Music, and Apple Music how is that a good value? Because for the price you get access to a large library of high-quality FLAC files that are ready to stream. The Hi-Fi subscription also gets you 50,000 Master-quality songs through the desktop application. This is achieved by compressing the files with MQA technology (Master Quality Authenticated). All you need to know here is that it’s a way, way better way of compressing music than MP3. If you want a wide variety of music at high-quality sound it’s hard to beat, unless you plan on dishing out $350 for Qobuz Sublime+. But it’s not just the sound quality that makes Tidal worth the money. They also have something called Tidal X which is a series of live events specifically for subscribers. Perfectly mixed studio albums are great, but there’s something about live performances that still attracts crowds of people to random street performers. Tidal X are live shows that are exclusively for Tidal subscribers. If you’re not a subscriber, you can’t get into the venue. And the shows are usually in more intimate venues to begin with. It’s a cool twist on a streaming service because not only do you get an app that lets you listen to good quality music, but you also get some live performances thrown in for free. Well not really for free since you’re still paying for the monthly service, but you get the point. For starters, these aren’t the only streaming services out there. These are just the best. There are also some others like Pandora, SoundCloud, Deezer, Amazon Music, and Slacker Radio just to name a few. We included these services in the comparison charts, but they all fall short in one way or another. Except for Deezer, that one came very close to being on the list, but alas, we limited our choices to five. That isn’t to say that the rest of these services are bad, but they’re a little more niche and specialized than the ones we chose. For example, SoundCloud does have an on-demand service now called SoundCloud Go+, but their premium music library isn’t the biggest and a lot of what’s available is user-uploaded content. Again that’s not to say it’s bad, it’s just specialized. There’s plenty of amazing independent musicians uploading great music every day, but discovering those artists is a hassle and through streaming quality isn’t the worst out of anything we looked at it also isn’t the best. So when it comes to audio formats it’s hard to really know what means what, especially if this is your first time hearing about such things. What’s the difference between MP3 and FLAC? What does kb/s even mean? You can dig deeper into the subject to truly understand everything there is to know by reading this great piece from Rob Triggs over on our sibling site Android Authority, but essentially it comes down to compressed versus uncompressed audio files. MP3 is a compressed or “lossy” file and uses clever tricks to delete information that humans shouldn’t be able to hear. It does this with algorithms that delete bits of data at, for example, really high frequencies. It also deletes frequencies that are right next to each other since the human brain can’t differentiate between them. By deleting this information that’s technically inaudible, it’s able to make the overall file much smaller which is perfect for streaming. But it’s still deleting data. The benefits of MP3 are all in the size. The files are so small that you won’t need super fast internet speeds to stream your music. The file formats that are best suited for streaming music at a higher quality. But that convenience is sacrificing quality. If you want the full quality file with no data cut out, that’s where lossless files like FLAC (Free Lossless Audio Codec) and WAV ( or Waveform Audio File Format) come into play. The problem is these are larger files, so it isn’t really ideal for mobile. But ideal doesn’t mean impossible. 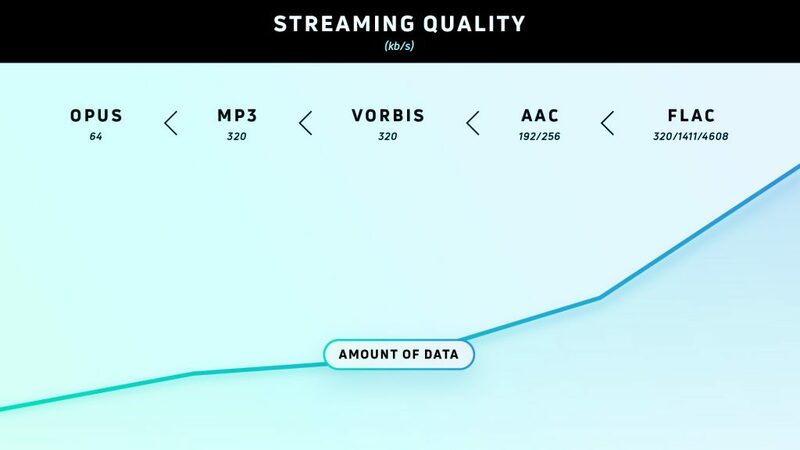 There are still services like Tidal that let you stream uncompressed files, and the desktop versions of Tidal, Qobuz Sublime+, and Deezer can stream extremely high bitrates. If you don’t want to spend any money, it might be good to hear that you don’t have to. Most streaming services have a free model that lets you listen to music with varying levels of control. Just be prepared for ads. Lots of them. They have to make money somehow right? Some services, like Spotify and Pandora, just play a station on shuffle with ads dispersed in between. Spotify even beefed up their free model recently to include a few of their most popular playlists. With more music that you could listen to in a lifetime, finding songs that you like can be difficult. So part of what makes streaming companies so successful is the ease of which their users can find new music that they actually like. With some services, like Spotify and Pandora, for example, you can start a “radio”. So after picking listening to a song that you picked, the service will continue to play songs that are by similar artists or in a similar genre. Other services, like Apple Music, take it a step further with a more traditional approach. One of Apple Music’s main features is live internet radio with popular DJ’s doing what they do best: playing a mix of new and popular music. But what if you already have a massive collection of digital music that you’re proud of? With some services like Spotify, Pandora, and Tidal, you’re out of luck. But others let you bring that music with you wherever you go thanks to Music Lockers. Google Play Music, Apple Music, and Amazon Music will let you upload tens of thousands of songs for free to their cloud servers. So if you ever get the urge to listen to something that isn’t included in their massive libraries you can. It’s worth noting that Amazon has already put a time limit on how much longer this feature will be available, but for Google Play Music and Apple Music there isn’t an end in sight.